The days when conservation and technology could not be spoken of in one breath are passé. Information Communication Technology (ICT) today has some really amazing uses in the field of conserving biodiversity. Recently, a study conducted by Conservation International (CI), Indonesia, camera-trapped an impressive 29 animal species in North Sumatra. 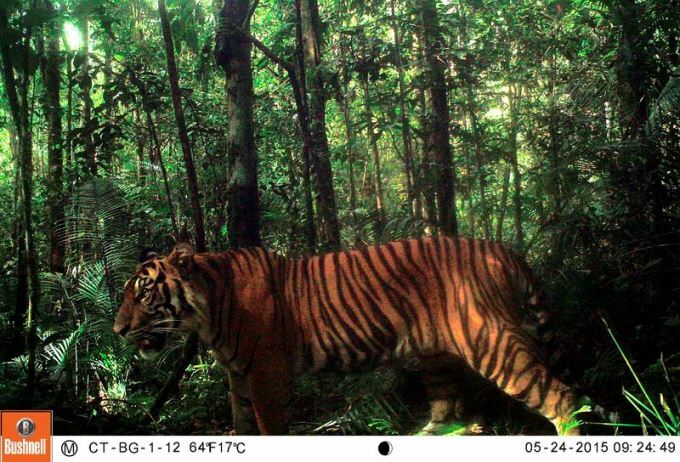 The cameras, placed at the Batang Gadis National Park (BNGP), significantly documented five endangered species- the Sumatran clouded leopard, the Sumatran tiger, the Sunda pangolin, the Asiatic wild dog and the Malayan Tapir- for over thirty days. Other documented animals include the four of the five Sumatran wild cat species, the endemic bronze-tail peacock pheasant and the Salvadori’s pheasant. These results further support the listing of over 60 per cent of the park as an internationally recognized Key Biodiversity Area, showcasing its global value and need for careful and effective management. The Malayan Tapir is the only tapir native to Asia. Further, in Indonesia, it is only found on the Sumatra Island. Keeping track of such species can be very helpful in conserving them, and this has been much simplified today by the use of ICT. The Ministry of Environment and Forestry, Indonesia, is focused on protecting the Tapir, along with 25 other animal species in Indonesia, due to their endangered status. The findings follow the signing of a Memorandum of Understanding between CI and the BNGP authorities to work together for protecting the area better. This landmark agreement aims to strengthen training and the overall skill set of those managing the protected area. Since the signing of the MOU, CI has worked closely with the BGNP through the Sustainable Landscapes Partnership program. This effort has built the capacity of forest rangers, and supported management of the national park. The facilitations include data collection and its transfer to a database through technical tools for monitoring and reporting, the use of mobile technology, and engagement with stakeholders so they are aware and onboard with this work. Through its Sustainable Landscapes Program, CI has also educated local farmers on how to farm efficiently and sustainably, so that their productivity improves and the remaining forests are not cut to provide for the growing demand of resources. Today, online databases, smartphone apps and crowd-sourcing have made it very easy to collect data on at-risk species. Through technology, we can collect data on species that are yet to be discovered, their locations and their rate of extinction. This will definitely lead us to many more discoveries in terms of species diversity, and at the same time help in their conservation, as we would better protect these areas, knowing their importance. The efforts of CI (and probably many other environmental organizations) are exemplary in such an innovative use of technology. It would be a welcome change to see other conservation sites embrace technology in this fashion and follow suit.